Chef Morimoto's trademark cuisine combines the best of Japanese and Western techniques. This signature style extends to his knife design. 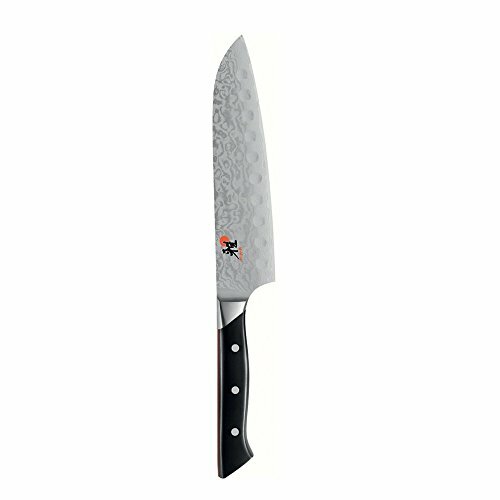 MIYABI Fusion Morimoto Edition fuses Western-inspired ergonomics with authentic Japanese blade styles and super steel. The MIYABI Fusion blade embodies Japanese tradition, with its 9.5 to 12 degree, hand-honed Honzabuke edge. The exceptionally sharp, thin blade allows for the precision cuts synonymous with Japanese cuisine. The VG10, super steel blade is protected by a stunning 64-layer flower Damascus pattern and complemented by an easy-to-care-for POM handle. Sculpted in a Western-style — thicker at the end to prevent slipping — the handle fits comfortably in your hands for tireless cutting. Handcrafted in Seki, Japan.